Tribeca pulls anti-vax documentary by Andrew Wakefield from its lineup. … or Biggest Medical Health Success in Human History, which is what I’d go for. The Tribeca Film Festival is an extremely popular New York–based event designed to showcase the city as a destination for independent moviemakers. That’s great, and I’m glad it exists and supports non-Hollywood creators. However, this year it almost made a massive mistake that would have hurt it—and very likely others—in the long run. Until Saturday, the festival was planning on airing an anti-vaccination film almost guaranteed to be full of dangerous misinformation. The good news is, after facing pressure from the media and scientists, it made the right decision: They pulled it from their lineup, and my sincere thanks goes to them for doing so. But it’s worth discussing, because things like this have happened before, and no doubt will again. The “documentary” is called Vaxxed: From Cover-Up to Catastrophe, which right away gives you an idea of what it’s about. 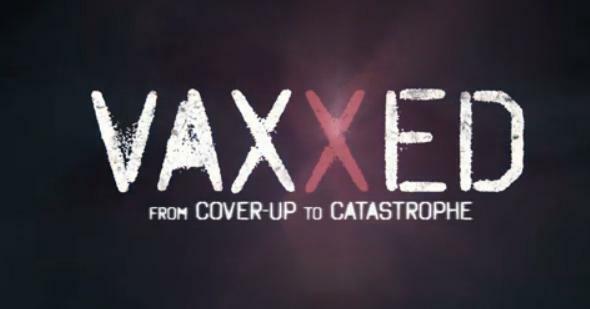 The trailer is available on the official film site, and it is loaded with anti-vax propaganda (they refused to provide screeners of the documentary to journalists). Moreover, the film was directed by Andrew Wakefield. Yes, that Wakefield, the de-listed and disgraced doctor who started the modern anti-vax movement. I’ll get to him in a moment. Based on the trailer, it appears to focus on the claim that in 2014 a whistleblower in the Centers for Disease Control and Prevention leaked information that there was a massive cover-up inside the agency about a purported connection between vaccines and autism. This conspiracy theory lit up social networks, but there’s one problem: It’s baloney. It’s been debunked numerous times; Snopes.com has a good overview, and you can get details at Science-Based Medicine, Harpocrates Speaks, and in numerous articles by Orac at Respectful Insolence. Let me be clear: This CDC conspiracy theory is on the level of the Apollo Moon hoax. It’s nonsense. But apparently the people behind Vaxxed think it’s real. The Vaxxed trailer employs a lot of typical anti-vax rhetoric, for example confusing causation with correlation (that is, confusing timing with cause; children start showing signs of autism around the same time they get vaccinated, so anti-vaxxers assume that vaccines cause autism). It also features a laundry list of anti-vaxxers in it, including Reps. Dan Burton, R-Indiana, and Bill Posey, R-Florida, Dr. Jim Sears, and MIT senior researcher Stephanie Seneff. Again, let me be very, very clear: Vaccines don’t cause autism. Study after study after study shows this to be the case. In other words, given what the trailer shows, this documentary is what comes out the south end of a north-facing bull. 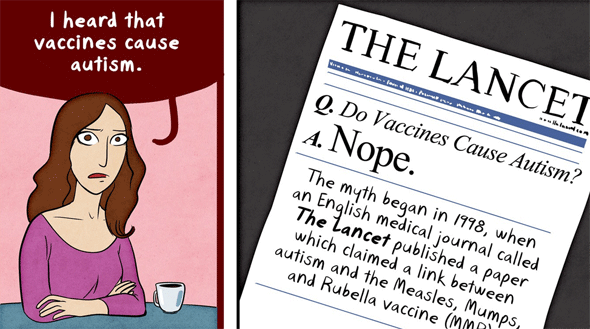 A panel from a fantastic Web comic debunking anti-vax claims, with a focus on Wakefield, by my pal Maki Naro. Click to read the whole thing, which I highly recommend. And, amazingly, it gets worse. As I said, it was directed by Andrew Wakefield. If you need a reminder: This is a man who wrote the 1998 paper in the Lancet claiming to connect vaccines and autism … which was retracted by the journal when it was found that Wakefield acted unethically, even fraudulently. His license was revoked by the U.K. General Medical Council as a result of these actions. It turns out that at the time he was developing an alternative version of the MMR vaccine, so he was financially motivated to fearmonger the standard shot. And I do mean motivated: He stood to make tens or even hundreds of millions of dollars had he been successful. Then, once the fear took hold, vaccine rates dropped in the U.K., and measles made a roaring comeback, he had the gall to try to shift the blame to the U.K. government for the outbreaks. Yeah, quite a guy. So why the hell was Tribeca even thinking of showing anything created by this man? It turns out it was due to Robert De Niro. I understand the need to have a discussion about this issue … but that discussion has already been held, many times, and the conclusion is clear: Wakefield is a quack (at best), and vaccines don’t cause autism. My heart goes out to De Niro, and the love he has for his family is obvious. His desire to use this platform as a soapbox to get information out is laudable, but in this case it’s misinformation; what he’s doing is promoting an extraordinarily dangerous movement, one that most definitely is connected with outbreaks of harmful and potentially fatal infectious diseases. We’ve seen this over and again. Worse still, a panel discussion planned for after the film screening was clearly biased toward anti-vaxxers, including reporter Sharyl Attkisson, who is an unwavering supporter of Wakefield even in the face of the tsunami of evidence against him. Even with De Niro’s possibly well-intentioned desires, airing this film wouldn’t invoke “a discussion.” It would’ve been a tacit (and, given the panel after, overt) approval of a group of people who ignore overwhelming scientific evidence at the very real risk of peril to public health. The anti-vaccination movement is a direct threat to children too young to be vaccinated—some of whom die from these diseases—the elderly, and the immunocompromised. I love my family too, one of whom is immunocompromised. So to me, this is personal as well. That’s why my daughter, my wife, and I are fully vaccinated. We get our boosters on schedule, too. Precisely right. And kudos to him for saying so. I’m sure the anti-vaxxers will moan and wail over free speech—they always do when someone decides not to air their nonsense—but it’s not a free speech issue at all. First, Tribeca is not the United States government, so the First Amendment doesn’t apply. They have full discretion over the films they choose. Second, the anti-vaxxers still have the ability to spread their message on social media and on the usual websites and TV shows, as dangerous as this is. So we must remain vigilant. Anti-vaxxers buy space on billboards, they get airlines to air puff piece interviews on the in-flight TV (one that was eventually pulled as well), they get on TV talk shows (Katie Couric apologized for that, sort of). Their view is sympathetic: They want to help people, they have families they want to protect, they are mothers and fathers. But the bottom line is they’re wrong, and what they’re saying is dangerous. I’m very happy Tribeca reconsidered this. They’ve done the right thing. Good on them. 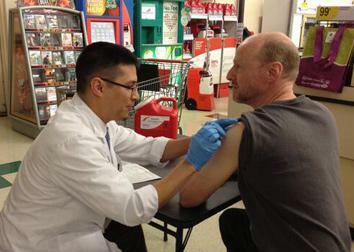 Read more of Slate’s coverage of vaccines.